A beautiful Personalised Five Ring Russian Necklace handmade by Posh Totty Designs. This is a timeless piece to cherish; can be worn day or night and is a lovely addition to any outfit. Each ring is gently hammered to give a planished finish. 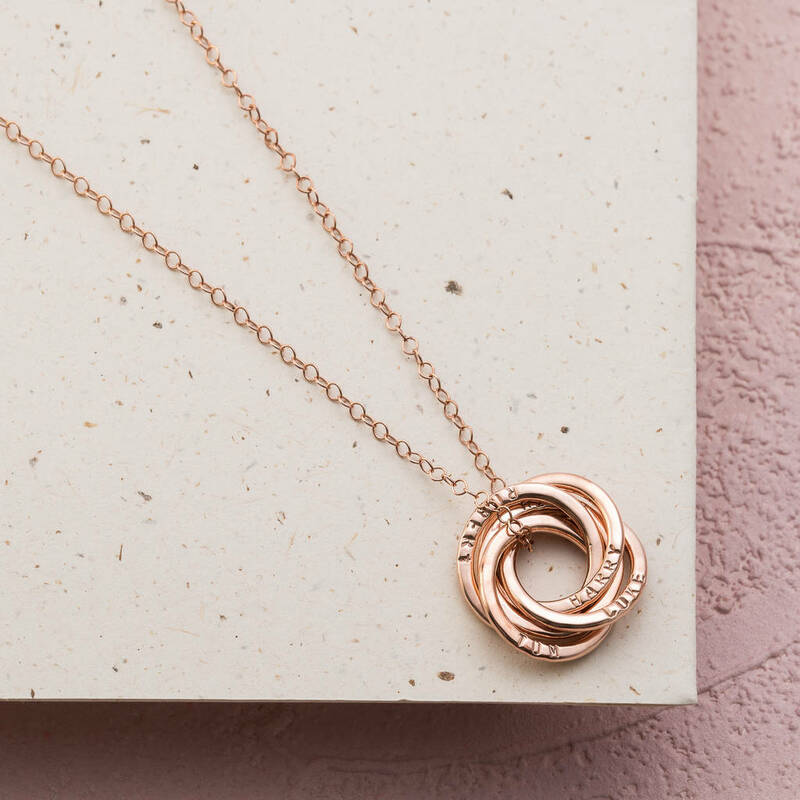 Part of the charm of this piece is the fluidity with which the circle pendants move upon the chain. 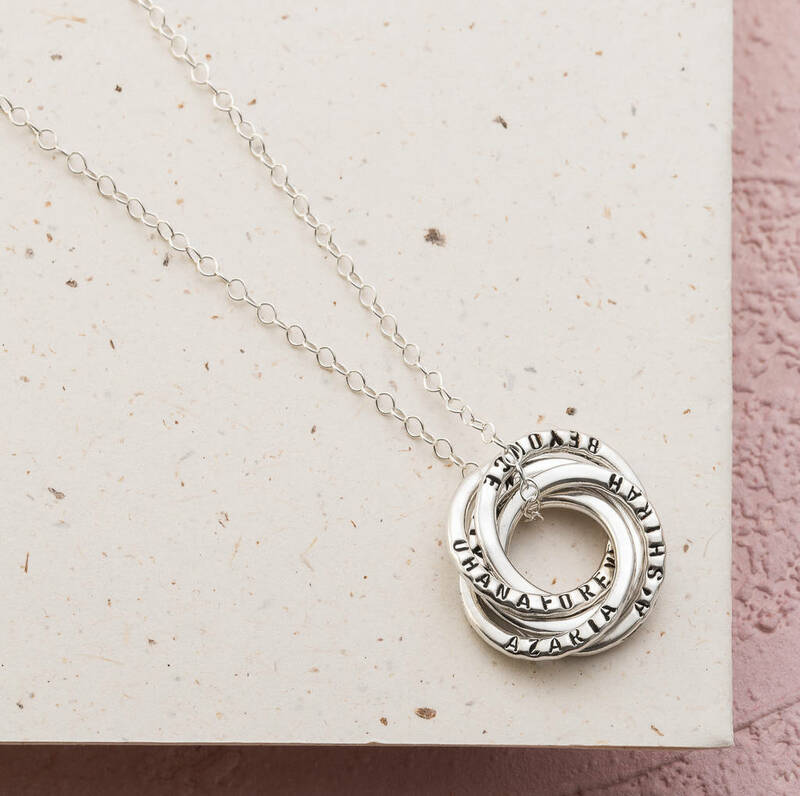 Our most popular personalisations include: names and dates of birth of children, names of newlyweds and the date of their special day, or any other personal sentiments that are special to you or the recipient of this lovely necklace. 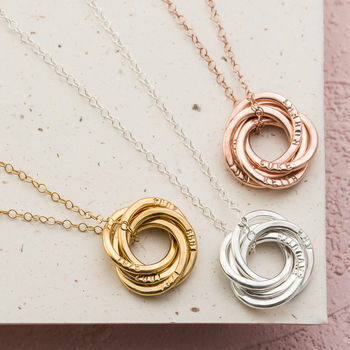 Comes in 925 sterling silver with the option of 9ct yellow or 9ct rose gold plated finish. Choose from black and clear letter finish. Black finish is not available on Gold plated items. This item can be purchased blank and can be returned to us to hand-stamp at a later date. If you wish the necklace to be left blank, please write BLANK in the personalisation box. We have a three day express delivery service at £25 (on working days) on a select few of our products if you require a gift without delay. This service ensures your order is made and delivered within three days (if ordered before 12pm). This delivery service will deliver your order before 1pm and will require a signature on receipt. We are not able to offer three day delivery for international orders. We can only stamp the Roman alphabet in the font shown in the product images. The following punctuation and symbols are available full stop, comma,'&', '@', '#', '! ', '( )', '?'. plus all numerals. For more unusual characters, such as umlauts, fadas and other accenting, please get in touch to check whether this is possible before placing your order. The Five Ring Russian necklace is available in 925 sterling silver, with a 9ct yellow gold plated or 9ct rose gold plated option. Choose from black and clear letter finish, although black finish is not available on Gold plated items. 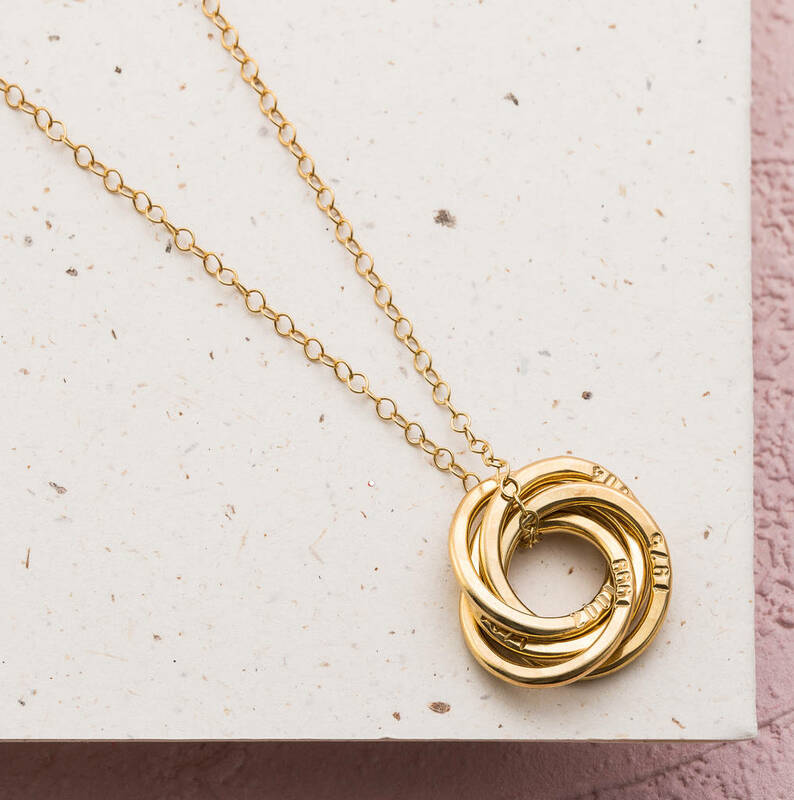 Each ring measures approximately 1.8cm in diameter and can fit 12 characters including spaces on the front side only. The rings are made from 2mm round silver wire (please note this measurement has been taken before each piece is gently hammered to attain our signature finish, so measurements are an approximation). 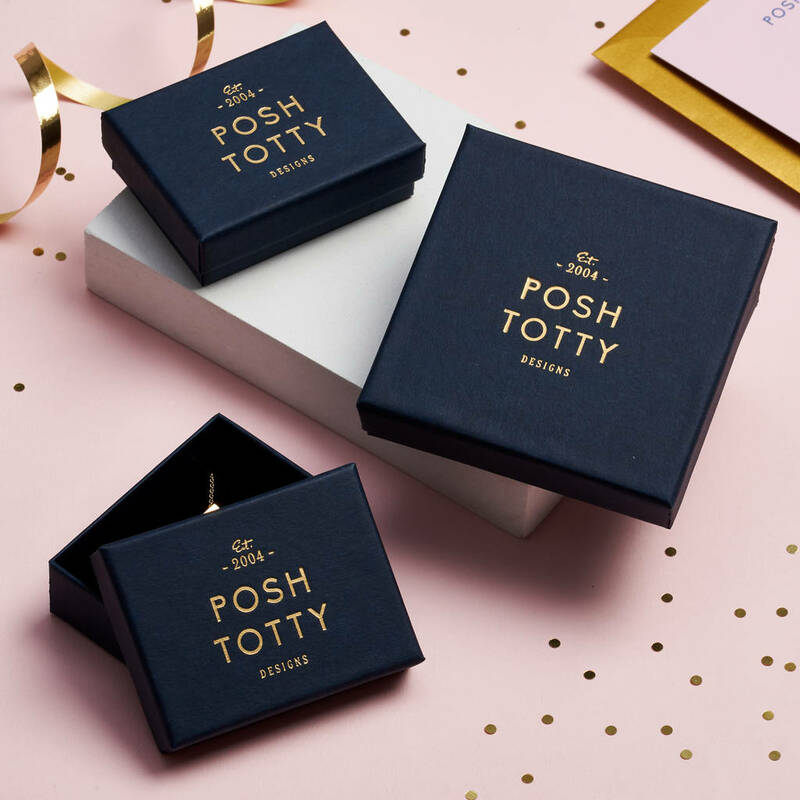 The necklace comes presented in one of our branded Posh Totty Designs gift boxes. The hand-stamping is in a 1.5mm font it runs horizontally around the rings. We have a 3 Day express delivery service at £25 ( on working days) on a select few of our products if you require a gift without delay. This service ensures your order is made & delivered within 3 days (if ordered BEFORE 12pm) This delivery service will deliver your order before 1pm and will require a signature on receipt. We are not able to offer 3 Day delivery for International orders. 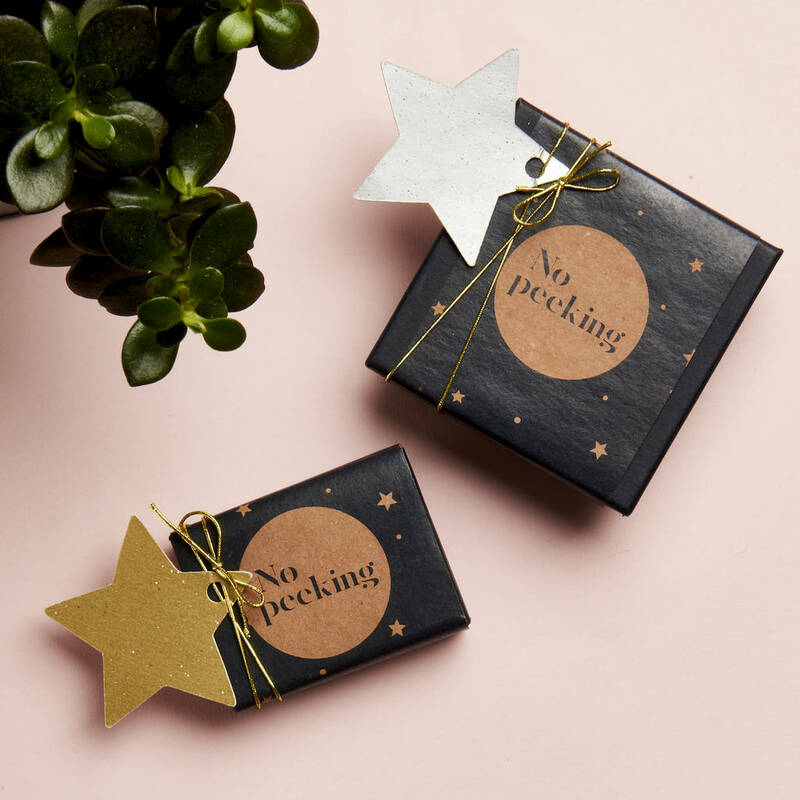 Orders placed AFTER midday will be accepted the next day dispatch time is given from the time of acceptance. Orders placed at the weekend will be accepted the following Monday.